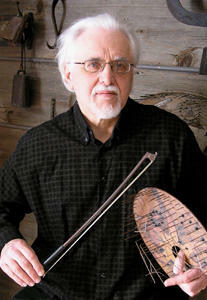 "Shapes Of Sounds: Hearing With Your Eyes"
Hal Rammel is a Wisconsin visual artist, musician, composer and instrument inventor. Some of his instruments are included in the National Music Museum exhibit, the Shapes of Sound: Hearing with your Eyes. The exhibit features more than 40 unusual instruments in a special exhibition that explores some of the museum's Seuss-like holdings, as well as new and unusual musical instruments, instruments made from found objects, experimental musical instruments, and even some whimsical instruments. A gallery talk and reception is this evening from 6-8 p.m.